Downton Abbey is one of my absolute favorites - even if I am still mad at them for killing of Matthew last season. Besides getting wrapped up in the characters' stories, I get lost in the period setting. The scenery is amazing and the styles are sublime. See - I'm getting a little giddy just writing about the show! So when one of my favorite bead stores, Bello Modo put out a challenge based on Downton Abbey and Vintaj, I couldn't resist. A waterlily ribbon slide by Vintaj became my focal, and to tie it in a little with my cord color, I hit it with some gilders paste. I think it really shows off the graceful curves of the piece. 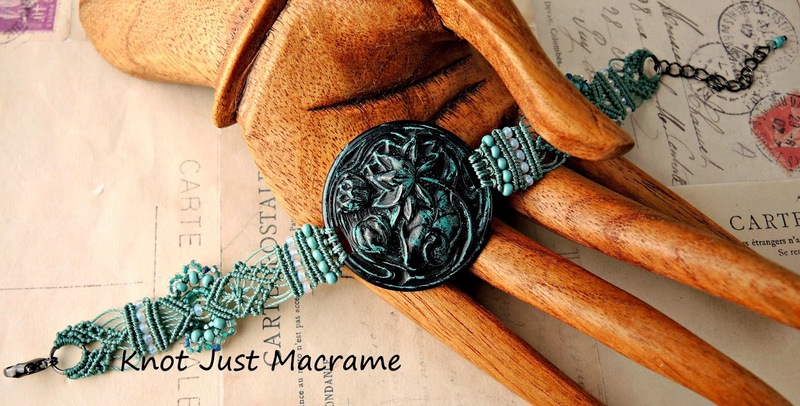 I echoed some of the curves in the micro macrame band, and accented it with vintage Venetian seed beads and some really old (antique?) glass seed beads of unknown origin (maybe French). Using vintage beads was very different than the precise Japanese seed beads I usually use. They are very much more imperfect both in cut and color distribution, but really like the feel they bring to this piece. Even though neither Vintaj nor nylon bead cord were available during the time period, I had great fun with the inspiration. And it was a great excuse to finally use some of the vintage beads I've been hoarding! Nothing inspires me quite like a fun, fresh color palette. My mom loaned me one of the quilts she made (she's amassing quite an impressive collection) to change up my bedroom for a few months. 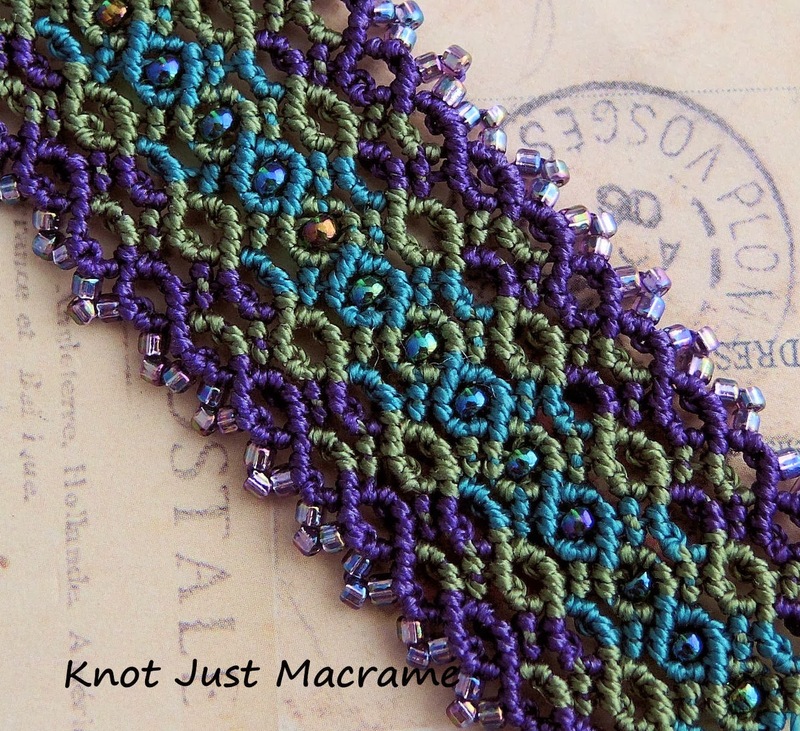 I chose this one in shades of purple, teal and olive green, and then was inspired to create a palette of cord and beads based on the quilt. I found lots of seed beads in the purple and lavender colors, as well as the teal tones from the lower right corner of the quilt. The upper left has greens that move from olive into a deep avocado color, and I found lots to mimic those tones, too. If you look a little closer, you'll notice bits of a mustard/gold color sprinkled in there, too. LOADS of inspiration for me! I've been messing with this sinuous curvy pattern lately and I think it works really well in these colors. I added some sparkle with a row of beads down the center and a shiny picot edging. 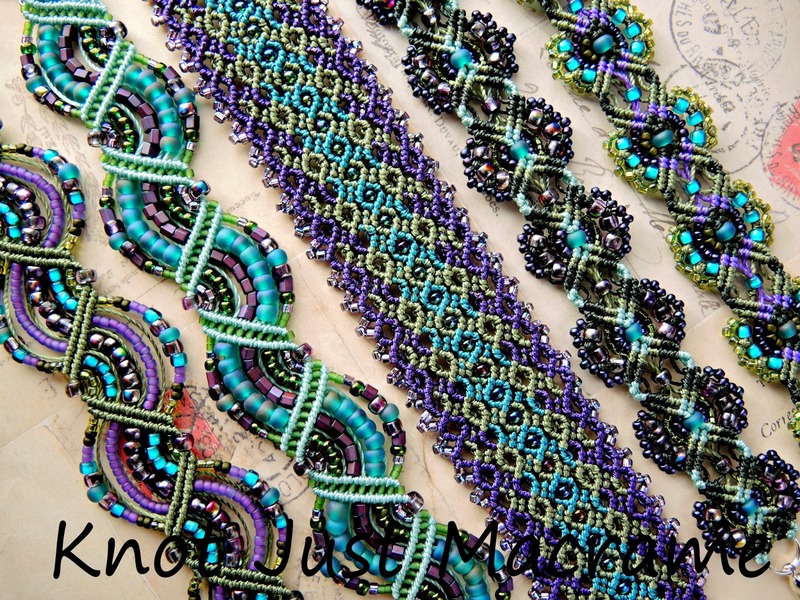 The jewel tones in this piece are reminiscent of peacocks. Today I thought I'd play with a design with a few more beads. These colors are definitely helping take my mind off the January weather!